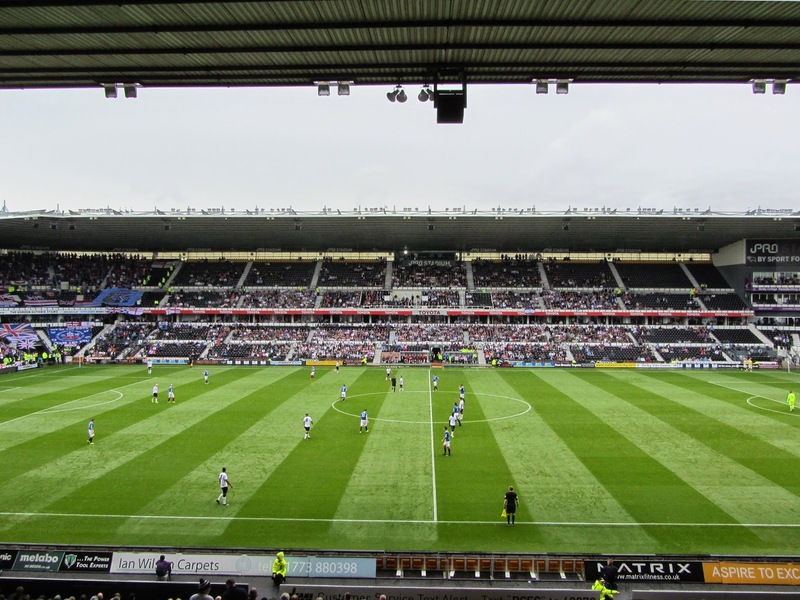 My fourteenth stadium of 2014 was on Saturday 2nd August at Pride Park in Derby, Derbyshire. The match was Derby County vs. Rangers in a friendly. 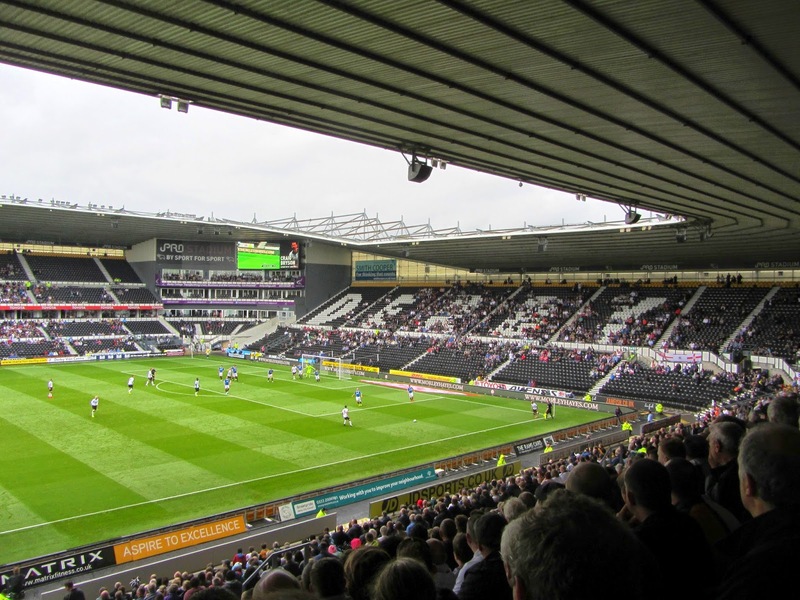 Pride Park Stadium, currently known as the iPro Stadium for sponsorship reasons, is part of the Pride Park business park to the east of the city centre and around three-quarters of a mile from Derby railway station. The club moved to the stadium in 1997 having left the Baseball Ground which had been their home for the previous 102 years. The West Stand is the largest in the ground - it has two tiers with executive boxes in between the levels for the length of the stand. The structure extends round into the south-west and north-west quadrants with the latter consisting of an extra two levels of hospitality areas with a big screen above this and a small amount of general seating on the lower tier. This side of the venue also contains the club reception, ticket office and a Starbucks built into the outside of the north-west quadrant. The rest of the stadium is a bowl shape which takes up the North, East and South Stands. Because these stands are lower than the West Stand the roof dips down to take this into account. If the club become established in the Premier League there is an option to increase the capacity of these three stands up to the same height. The club shop is located in the East Stand and there is also a Greggs built into the north-east quadrant. 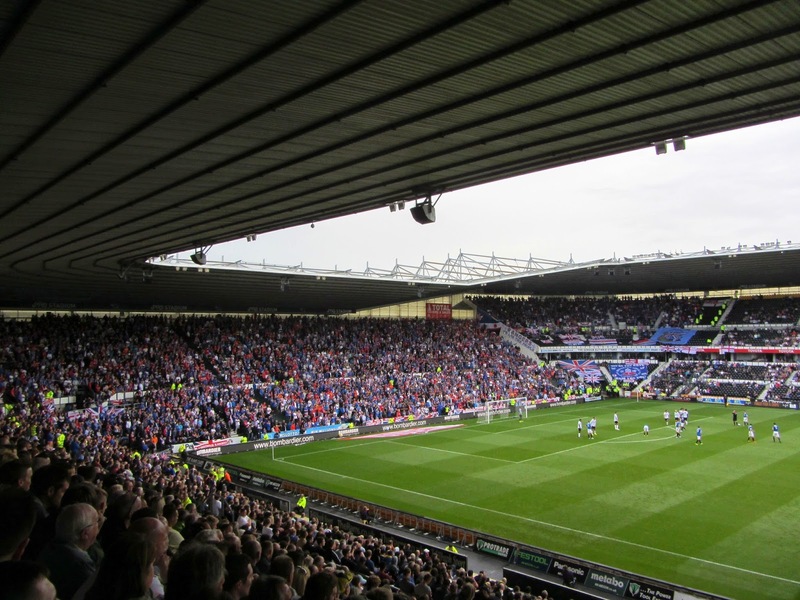 The game was a friendly between Football League Championship side Derby County and Scottish Championship side Rangers.There was a massive travelling contingent of almost 10,000 Rangers fans at the friendly and their side came close to opening the scoring on 15 minutes. Kenny Miller crossed the ball for Fraser Aird who headed wide from just a couple of yard out. Derby grew stronger as the half progressed and had a shot cleared off the line just before the interval. In the second half the home side were on top and just before the hour mark took the lead. Simon Dawkins got into the box and was able to draw two Rangers defenders and the goalkeeper away from the centre allowing him to cross the ball for Chris Martin to slide into an empty net. In the 73rd minute later the home side doubled their lead when Will Hughes ran through the visiting defence before laying a perfectly timed through ball for Martin who tucked the ball under the advancing goalkeeper. A couple of minutes after this Martin was involved in an off the ball incident with Rangers defender Bilel Mohsni. The Rangers man took exception to being tackled and flew head-first into Martin's chest. The referee was left with no option but to send Mohsni off for this ridiculous act. Derby narrowly missed notching up a third goal with the last kick of the game as the ball flashed wide from a free-kick but the game finished 2-0.